When professional baseball returns in 2014, it will throw the first pitch at Sydney Cricket Ground in Sydney, Australia, a venue that features LED video displays from Daktronics of Brookings, South Dakota. The first game schedules the Arizona Diamondbacks playing host to the Los Angeles Dodgers on Mar. 22. 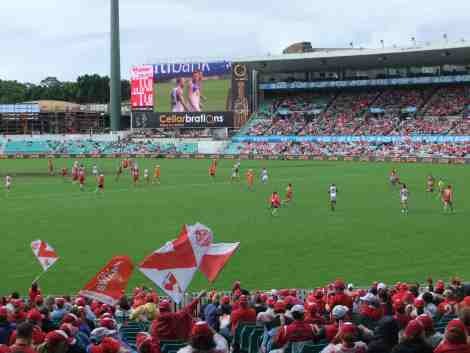 Sydney Cricket Ground features a Daktronics 15HD LED video display that measures approximately 36’ high by 81.5’ wide. This recently installed (in 2013) display incorporates excellent image clarity and contrast with wide angle visibility while also providing multiple levels of protection from the elements. The game-day production will consist of the same high-quality elements as any game played in the U.S. by employing the same baseball control software and Daktronics powerful DakStats software solution. Dakstats is the premier software for managing game, season and career statistics. It delivers and tracks statistics and in-depth statistical reports for all levels of play. Daktronics is working with Sydney Cricket Ground to consult on how best to stage a professional baseball game in a cricket venue while working with professional baseball contacts stateside to cover all of the details necessary for a top-notch production. Keeping with today’s standards in video display capabilities, the main video display can show one large image to highlight live video and instant replays. It can also be divided into separate windows to show a variety of vivid graphics, colorful animations, up-to-the-minute statistics, scoring information and sponsor advertisements. This entry was posted on Thursday, March 13th, 2014 at 17:00 @750 and is filed under Scuttlebut. You can follow any responses to this entry through the RSS 2.0 feed. You can leave a response, or trackback from your own site.